This adapter is for 15mm Boost forks. It is compatible with the Thule 561 Roof bike carrier and anodised in black. Similar to the Thule 561-2 accessory. 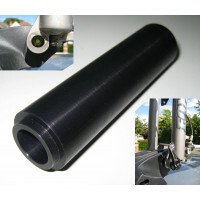 The adapter measures 110 mm wide with a 15 mm hole in the middle for the axle. Note that the bike cannot be locked with a key using this adapter. We custom machine make these adapters to a high specification and tolerance, so you won't find them anywhere else. This adapter is for QR15 forks. It is compatible with the Thule 561 Roof bike carrier and anodised i..